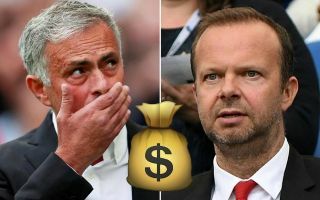 Man Utd boss Jose Mourinho reportedly wants the club to make a €60m bid to address their defensive frailties, while an influential figure could provide him with a contract boost. The Red Devils have conceded 14 goals in just eight Premier League games so far this season, giving them the worst defensive record of the top 15 sides in the table. That exposes their biggest flaw currently, and so Mourinho will undoubtedly want to address that sooner rather than later. As noted by The Independent, the Portuguese tactician was left frustrated with the inability to sign a defender this past summer, and so perhaps we now know why. Whether or not that changes next year remains to be seen, but according to Calciomercato, Mourinho wants Man Utd to snap up Fiorentina defender Nikola Milenkovic with a €60m bid being specifically mentioned in the report. The 21-year-old has been hugely impressive for the Viola so far this season as he has provided defensive solidity at the back for Stefano Pioli’s side while also scoring two goals in eight Serie A outings. Having made his breakthrough at the end of last season from January onwards, it appears as though the Serbian international hasn’t looked back since and could now be in the sights of Mourinho and United, ahead of a potentially huge bid being made to prise him away from Italy. Meanwhile, The Express also report on positive contract news as it’s claimed that David De Gea could be open to committing his long-term future to the Red Devils, beyond the additional year extension option that the club have in his current deal. After overcoming a tricky start to life in England when he arrived at Old Trafford in 2011, the Spaniard has gone from strength to strength since and has undoubtedly established himself as one of the top goalkeepers in Europe. With that in mind, Mourinho and Man Utd will surely be desperate to see him commit his long-term future, and based on the report above, there appears to be a growing sense of optimism over that happening.